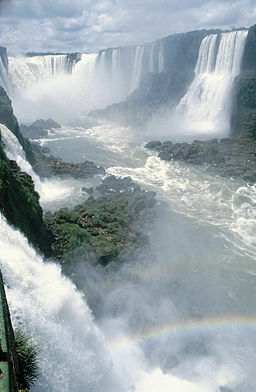 When our sons were small, we took them to see Iguaçu Falls, one of the seven natural wonders of the world. The panorama of hundreds of waterfalls, crashing from their height of 265 feet, was one of the most achingly beautiful sights I’ve ever seen. Everyone around us was laughing and shouting with the sheer joy of such magnificence. I was miffed, though, when I discovered one of our boys was stopping to exclaim over rocks and bugs on the trail and was missing the whole show. It made me think of people who are so focused on inward stuff that they miss the “big picture” of what God is doing in the world. But now, many years later, I find that maybe little Nathan wasn’t so wrong after all. He didn’t need an overwhelming sign of God’s greatness to be filled with wonder. Those shiny rocks and those colorful bugs were proof enough that God was amazing. The June 3rd reading from My Utmost for His Highest echoed this idea: The things that make God dear to us are not so much His great blessings as the tiny things, because they show His amazing intimacy with us; He knows every detail of our individual lives. As we grow in intimacy with Him we learn that every good and perfect gift comes from Him (James 1:17) – every good night of sleep, every square meal, every friendship, etc. The big things remind us He is great, but the little things remind us He is also good. I love this and hope everyone experiences God love for them in the small things.